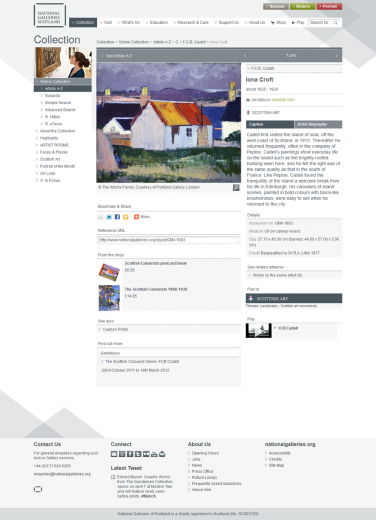 The current incarnation of National Galleries of Scotland website was originally developed in 2007 and has been constantly updated, enhanced and redesigned since then in order to contribute to make the Galleries’ world-class art collection accessible to the widest possible public. The Collection section has always been at the heart of nationalgalleries.org, gives the visitor multiple ways in to (and out of) the artworks online. 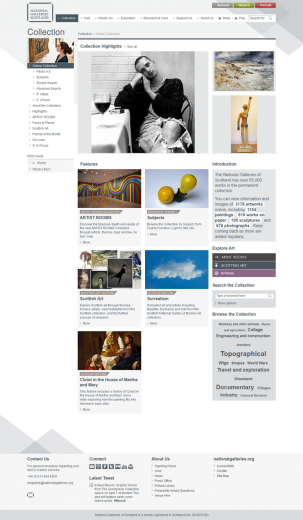 New works are added to the online collection all the time, and the work of art page provides as much information as possible to the visitor by connecting each work to related exhibitions, website features, products, and other works of art. There are collection highlights and advanced search options as well as detailed looks at Scottish Art and the ARTIST ROOMS collections, plus special In Focus features on specific artists, artworks and projects. All of these include various different kinds of media, from video to in-depth essays. The Play section brings together all video and audio content across the site and also shows users where they can find out more by linking to the areas where films and audio are used across the site. The most recent redevelopment concentrated on making information clearer for each of the three sites across Edinburgh by grouping exhibitions, events, and displays with other visitor information in new hub pages – the Scottish National Gallery, the Scottish National Portrait Gallery, and the Scottish National Gallery of Modern Art. These pages show the most important information at a glance, like opening hours, featured exhibitions, and the next events at that gallery, and provide links to all information relating to that gallery. Features like interactive floor plans and themed, printable trails help visitors plan what they’d like to see. 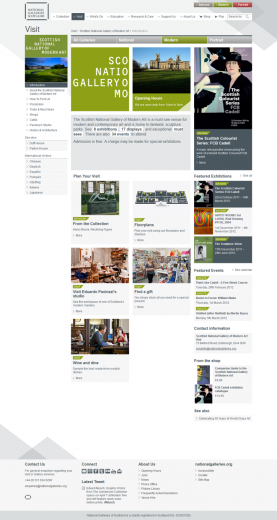 The redesigned What’s On section brings together events and exhibitions across all sites, but also allows visitors to filter by site or type of event. The Support Us section gives visitors many different ways to donate to and support Gallery activities, including targeted giving and fun ways to get involved, like Put Yourself in the Picture, which allows participants to actually appear in the Scottish National Portrait Gallery on designated touchscreens. 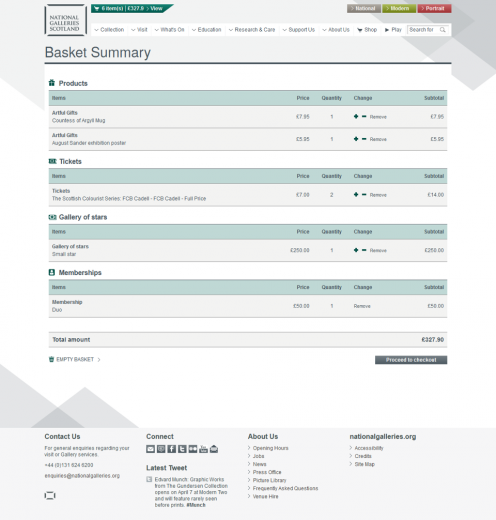 The shop integrates in a single shopping basket everything from tickets to donations and merchandise, which can be purchased in a single transaction. We have always kept transactional services as an integrated part of the website rather than sending visitors out to a third-party service. Usability and accessibility have always been high priorities when developing and improving the site. With every new development we always make sure it’s easy to find important information, and that all features are as accessible as possible to different browsers and users with disabilities.